UFO SIGHTINGS DAILY: UFO Caught Over Tucman, Argentina Construction Site on Sept 6, 2018, UFO Sighting News. 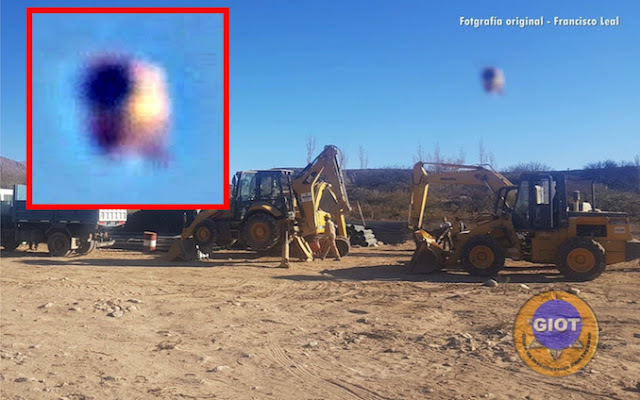 UFO Caught Over Tucman, Argentina Construction Site on Sept 6, 2018, UFO Sighting News. This report just came into me on Twitter today. A person in Argentina was hired to make a portable water facility and took two photos to show his boss that he was doing on the job. However the second photo had a UFO over some of his equipment. The UFO...when enhanced clearly has a round dark window for a pilot and this craft is about half the size of a motorcycle, but maybe much bigger if its far back behind the equipment...not over it. Aliens know that the human eye is flawed, there are parts of the spectrum we cannot see and an object moving at a high enough speed would basically appear invisible to us. Absolutely a great photo that has excellent evidence that we are not only being visited by aliens, but also monitored by them.